Metro Atlanta's growth slows, but 'Intown' is still booming! Hi there, and welcome to our first blog post! I want to start off on an issue that has been on the forefront of my mind for a while now. Seems like you can't turn on the news or read a paper these days without reading a headline implying that the sky is falling in regards to residential real estate. One must always remember the expression, "All real estate is local." 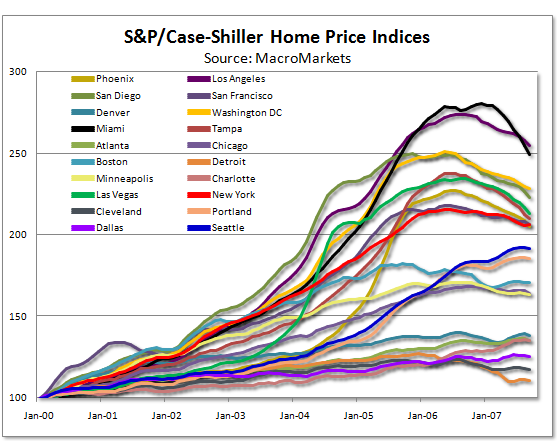 There is a huge difference between the "bubble" markets of Florida, California, Las Vegas, etc., and Atlanta ... especially Intown Atlanta! Image: Atlanta is in hunter green, near the bottom. Click for larger view. First of all, Atlanta is not a "bubble" market. We did not have the "irrational exuberance" indicated by a huge run-up in prices over a short period of time. Since we didn't have a bubble, there's no bubble to burst! Sure, sales have slowed down, but we are not seeing the decline in values that the bubble markets are seeing. Now, this is not to say that we can't have a decline in prices at some point in the future if, for example, the economy as a whole slips into recession. But if we do, it's not likely to be as bad as the aforementioned bubble markets.